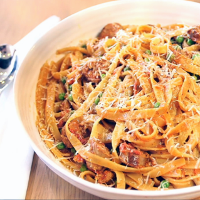 We challenged Brian Turner and Dhruv Baker to cook the perfect pasta dish for kids. Brian's Tagliatelle with peas & sausage sauce was the winner. To see the recipe for Dhruv's dish, click here. 1. Heat the oil in a pan, fry 4 sausages until golden brown, take out and cool. Take skin off the other 2 sausages and chop, add to the oil and fry until golden brown. 2. Slice the whole sausages into 1cm thick chunks and add to the sausage meat. 3. Add onion and garlic, then add the tomatoes and season. Cook together for 10 minutes until thick. Cook the pasta in boiling water according to pack instructions. Drain. 4. Add the peas to the sauce and stir in, then add the tagliatelle. Sprinkle with a little cooking liquor if necessary, check seasoning. Serve sprinkled with Parmigiano Reggiano.